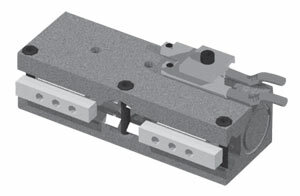 RPL Series Gripper is a pneumatic parallel gripper with excellent parallelism and accuracy between the gripper mounting surface and jaw surface. Jaws are front mounted and are supported with 'Dual-V" roller bearings to provide low friction motion and are preloaded for maximum support and zero side play. This gripper supports longer finger length designs compared to other grippers of similar sizes. These grippers are available in stroke lengths from 6.4 to 19.1mm (0.25 to 0.75") with a grip force from 116 to 160 N (26 to 36 lbs). Note: All models come with standard synchronous jaws, if non-synchronous jaws are required consult sales. All sensors and cables sold sepatately.